Now that my sewing skills are more advanced, I rediscovered my love for Gretchen Hirsch’s book “Gertie Sews Vintage Casual.” After making the ‘40s-Style Blouse in its sleeveless variation, I did not use the book again for a while. I am not sure why because I was really satisfied with the result. I ended up wearing this blouse a lot and it turned out to be one of my favorites. I don’t think that you have to be an advanced sewer to make the patterns in the book but maybe some of the variations require more skill. I also think that the book is quite helpful in improving your sewing skills. It has very informative sections on skills for knits and wovens and also for patternmaking. I had my eye on the Bomber Jacket for a while. It also helped that the bomber jackets are in fashion this year. 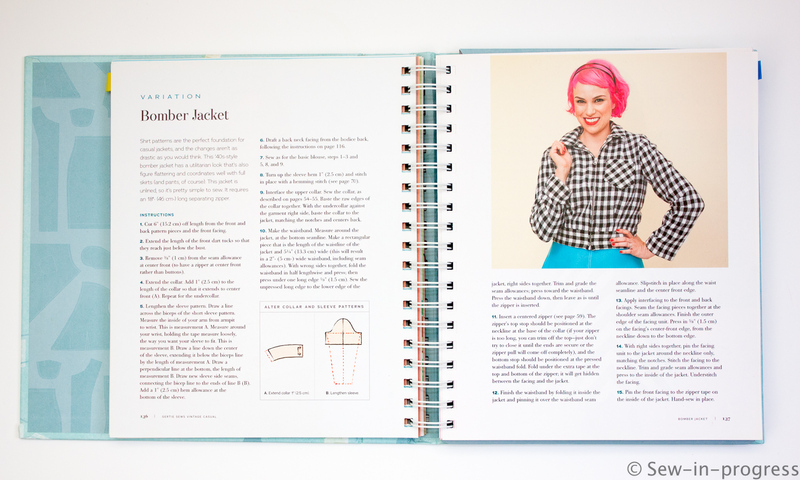 The jacket is a variation of the ‘40s-Style Blouse so you use the pattern from the blouse and the book gives instructions on how to make the necessary alterations. Most of the alterations were pretty self-explanatory. I just got stuck on one of them which was about “extending the length of the front dart tucks.” It took me a while to figure out how to do that but other than that it was pretty straightforward. 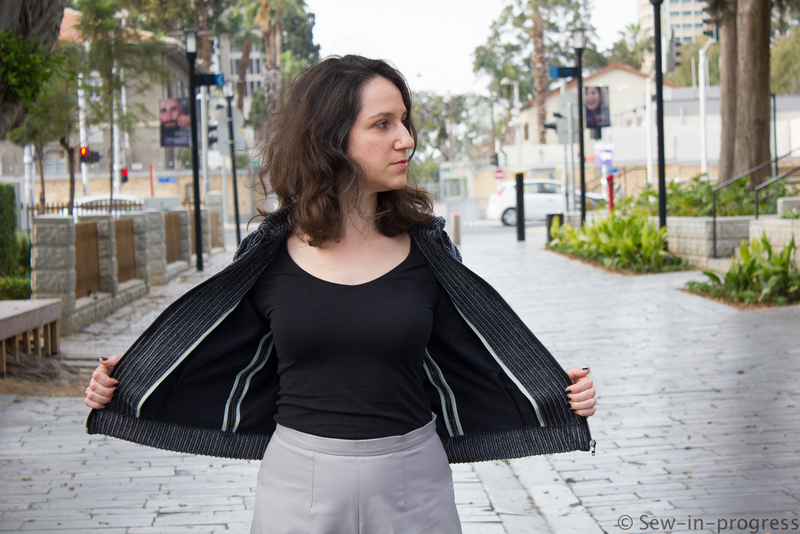 I made a muslin for this jacket and ended up changing the instructed alterations quite a bit. First of all, I made the jacket 6 cm longer than the one in the book. The sleeve turned out to be tight so I drew it again and added 1 cm on both sides. Also, the armholes turned out to be too snugly for my taste so I lowered them by 1 cm. I remember that this was also the case with the ‘40s-Style Blouse. It is totally a personal preference though. I just like looser armholes. Also, there were no instructions on what to do with the back tucks so I kept them. The fabric choice was perfect for this jacket. I used a charcoal colored corduroy. I bought the fabric online from misskumash which is a Turkish fabric store. The jacket is not lined so I used contrasting color bias binding to cover the seam allowances. I love it when the inside of a garment is as pretty as the outside. Overall, I was very satisfied with the final result. 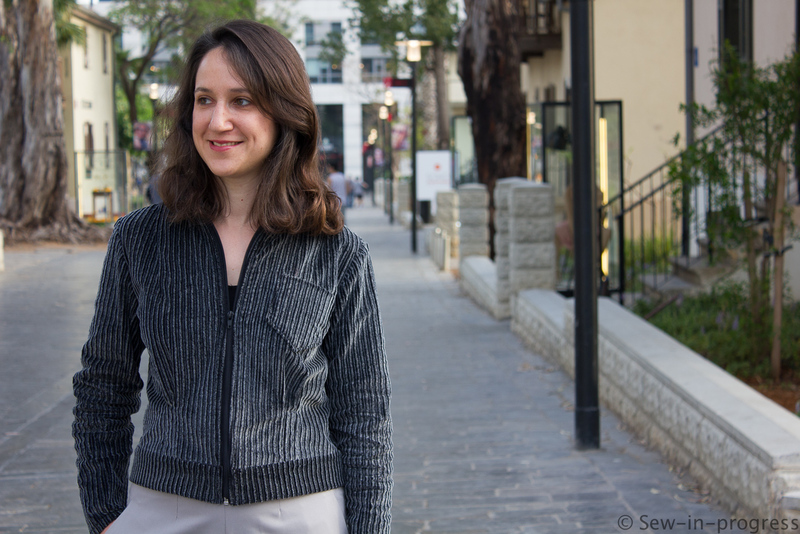 Since I made the jacket, I wore it quite a few times. It is perfect for spring. It was also fun to play with the pattern and change the shirt pattern into a jacket. Another thing that I like about the patterns in the book is that they include some hand sewing. Generally, I prefer to sew most parts of a garment using my sewing machine and most patterns do not include any hand sewing. The instructions in this book have a nice balance of machine sewing versus hand sewing. I feel that the act of sewing parts of a garment by hand really adds to the garment and at times it is easier. Do you ever hand sew parts of your garment? This bomber jacket is gorgeous, love the texture of it! Pingback: April Sewing Trends with Kelley | Sew Mama Sew | Outstanding sewing, quilting, and needlework tutorials since 2005.